There are about 30 “Locks” from Chicago to Mobile. In these locks you are lowered or raised in a big cement chamber anywhere from 5 to 60 feet. Our first major lock did not go so well… it didn’t matter how much we had read about these locks and what you are supposed to do. We had to experience our first one to actually understand how they work. Almost every other day we have to go through the next lock, and so far we have been very lucky with our timing. 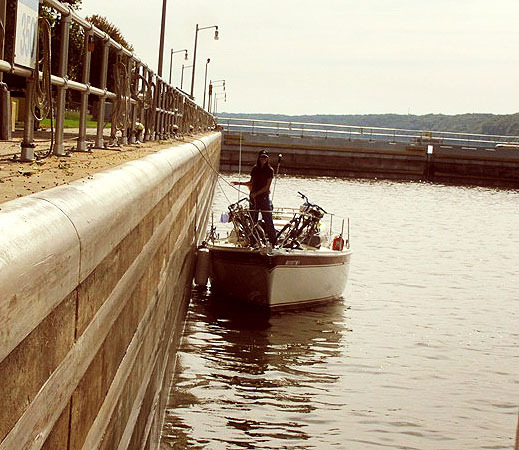 Many boaters are forced to wait for hours before entering a lock because of barge traffic. Speaking of barge traffic, this is yet another category that we have read and studied but did not truly understand before we left Chicago. Our first day we were in the Chicago Ship and Sanitary Canal. A very narrow canal with a lot of commercial barge traffic. There is just enough space to pass a barge on this canal, and if you are in the wrong place in the wrong time there is a good chance you will no longer be living. A standard barge is 195 ft long, 35 ft wide and weighs an average of 1500 tons. They connect up to 4 barges wide, and 6 long, equaling the size of a football field. The men that run the Tows which push the barges do not talk clearly over the VHF, making it a fun game to guess which side they would like you to pass. Scary. The first marina we stayed at was Heritage Harbor, in Ottawa Illinois. They had complimentary “Hydro-Bikes” that entertained us for the afternoon. We have been amazed at how little we actually stay in marinas. There are lots of lovely anchorages along the river, which means no marina fees! Because we are a small boat and cannot carry many supplies, every couple days we have to stop in marinas for diesel, fuel, laundry, showers, food. Overall, we have found that we enjoy anchoring out more than staying at a dock. 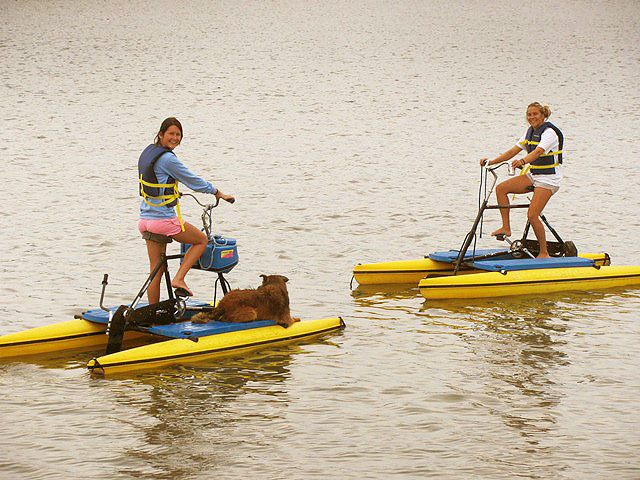 Except when there are hydro bikes involved.